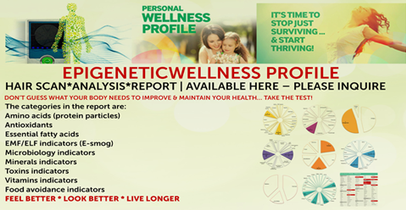 ​Environmental Epigenetic Hair Analysis and Wellness Report Gives Details to Improve and Maintain Your Health. The Bio-Profiler scans hair and gathers data that is sent over the internet to our Labs in Germany for analysis. A report is returned soon after that becomes a road map that guides you to improved health. With your report you can balance your Amino Acids, Antioxidants, Essential Fatty Acids, Microbiology, Vitamins, Minerals, EMF/ELF, Toxins and Food. Your Wellness Report is your road to improved health for a better life.